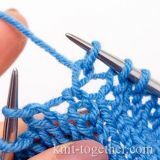 Knit Together | Crochet Ripple Stitch Pattern #2 with photo, description and crochet chart. 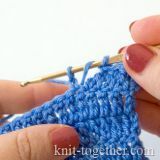 The rows of the slip stitches give the density. 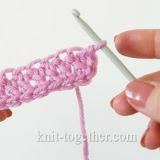 We make this pattern using a double crochet stitch and a slip stitch. 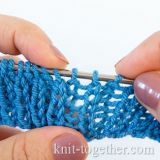 The rows of the slip stitches give the density. The fabric stretches very little both in length and in width. 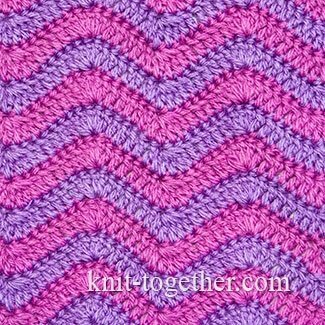 You can use this ripple pattern for crochet the interior items: coverlets, covers, carpets, and anywhere where else you need a special density. 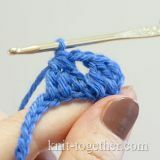 For crochet we use the yarn as least of two colors. The first and second row are made in one color, and the third and fourth row - the other, and so on. 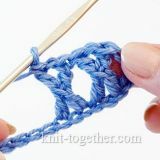 For an example make chain stitches a multiple of 16, plus 8 chains for the symmetry of the pattern, plus 3 turning chains. The rapport of the pattern in height - 2 row. 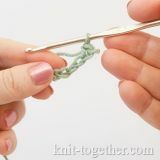 4 row: 1 turning chain, then slip stitch in each stitch of previous row. Then, we repeat 3rd and 4th row with alternating colors.